on Greece and Italy, which are on the front line of the migrant flood. But a senior European leader conceded the move was only a small step toward resolving one of the worst crises ever faced by the 28-nation bloc. Four eastern European countries — the Czech Republic, Slovakia, Romania and Hungary — voted against the plan, and it’s unclear if they will even implement it. Those nations have resisted accepting the forced resettlement of refugees on their territory. Slovakia would rather breach the measure “than accept such a dictate”, said Prime Minster Robert Fico. EU leaders will gather tomorrow evening in Brussels to try to adopt a unified approach to the crisis that has seen 477,906 people stream into Europe from the Middle East, Africa and Asia, according to estimates by the UN refugee agency. Some European countries have reinstated border controls to stem the flood, and Hungary has built a fence topped with razor wire on its frontier with Serbia. of taking decisions even if, for some member states, these are very difficult decisions”. 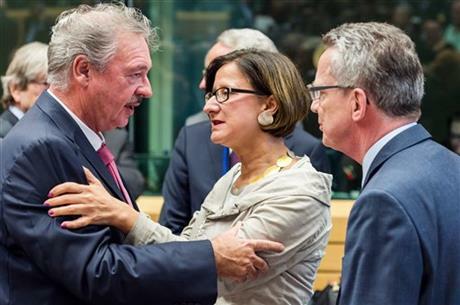 German Interior Minister Thomas de Maiziere, right, talks with Luxembourg’s Minister of Foreign and European Affairs Jean Asselborn, left, and Austrian Interior Minister Johanna Mikl-Leitner at the start of a meeting of EU justice and interior ministers at the EU Council building in Brussels today. But even Timmermans conceded it was only a small step, and plenty more remained to be done. The office of the UN High Commissioner for Refugees urged the EU to quickly set up facilities in Greece, where tens of thousands have arrived after making the hazardous sea crossing from Turkey. This may be “the last opportunity for a coherent European response”, said Melissa Fleming, a spokeswoman for the UNHCR. Today’s deal did not set mandatory quotas for each nation — one of the most contentious aspects of the proposed plan. It said that 66,000 asylum-seekers will be relocated from Greece and Italy, and 54,000 more in a year’s time. Amnesty International’s Europe director John Dalhuisen cautioned that agreed-upon numbers “are still too low, given the immensity of the current crisis”. “At long last, this is a step in the right direction, but EU leaders need to be looking ten steps ahead, not one,” he said. Timmermans said the EU has to do a better job of protecting its borders, registering arriving migrants, quickly returning those ineligible for asylum, and “providing hope and perspective” for those in conflict-torn countries. Germany’s Minister of the Interior Thomas de Maiziere, whose country is absorbing most of those pouring into Europe, said Germany would take more than 30,000 of the 120,000 asylum seekers. De Maiziere said the deal also aimed to cut “secondary migration”, in which those seeking asylum moved from one European country to another. “If people are distributed in Europe, then they can’t choose what country they go to. They have to stay in the country they were distributed to,” he said. Along the migrant trail through the Balkans in south-eastern Europe, the crisis continued and drew old foes into a new dispute. Serbia gave Croatia an ultimatum to reopen its border, threatening unspecified countermeasures. Croatia shut all but one of its crossings with Serbia last week to block the migrant influx, which has reached 34,900 in just a few days. But the action has crippled the economy in Serbia, a conduit for cargo across Croatia to Europe. Croatia started letting trucks carrying food from Serbia across the border this afternoon, but Serbia’s Prime Minister Aleksandar Vucic said that was not enough, adding that all cargo traffic must be restored. Vucic had called an emergency session of all security services, including the military, to discuss the crisis. The two nations have a tense history after fighting each other in the Balkan wars of the 1990s. Croatia was angry by Serbia busing migrants to its border.